Samford University’s trustee executive committee approved the naming of various components of the new Brock School of Business building, the appointment of a new provost and new faculty members, and the recommendation that 128 seniors who anticipate graduation this summer be granted their degrees. The executive committee, which meets between regular meetings of the full board of trustees, also heard reports July 28 on building progress, investments and enrollment. In addition to the new business school building opening this fall, Samford will open an Art Lofts building in the former Lower Shop building, said Harry B. Brock III, Samford’s vice president for business and financial affairs. The adjacent Upper Shop building is being demolished to make way for a parking lot for 44 cars. Other construction planned includes a temporary roadway and pedestrian access to Samford’s new College of Health Sciences (CHS) buildings on the eastern side of the campus, cafeteria improvements and repaving some streets. Renovation of the two CHS buildings will begin this fall or no later than January, said Brock. Samford’s endowment stood at approximately $274 million as of June 30, reported Lisa Imbragulio, Samford’s associate vice president for business affairs. 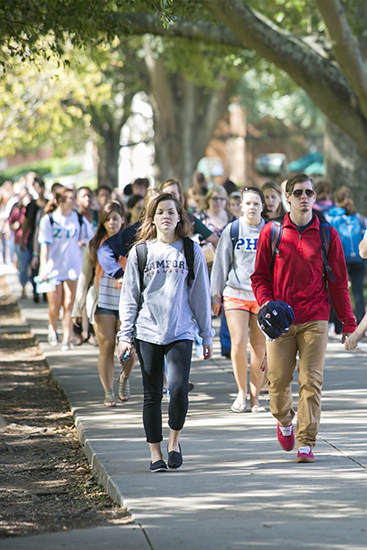 Samford will begin the fall semester with another record enrollment. Phil Kimrey, Samford’s vice president for student affairs and enrollment management, said the University anticipates a record-size freshman class of more than 800 students. That should boost Samford above 5,000 in enrollment for the first time in history. Kimrey said Samford expects to house 2,339 students on campus. The new business building will contain 57 classrooms, offices, conference rooms, seminar rooms and other components that donors have named with gifts totaling $2,525,000, said W. Randy Pittman, Samford’s vice president for university advancement. Pittman noted that Samford raised $18,131,342 during the 2014-2015 fiscal year. The trustees approved the naming of the Beeson School of Divinity student commons library/hospitality room for longtime employee Sandy Brinson, who retired recently after 25 years of service. The trustees also approved the election of H. Hobart Grooms Jr. as a life trustee. Grooms has served 22 years on the board of trustees beginning in 1992. Trustees approved the appointment of J. Michael Hardin as provost, professor of quantitative analysis in the Brock School of Business and professor of biostatics in the School of Public Health.